CD box and 78 page booklet packaged in cardboard slipcase. 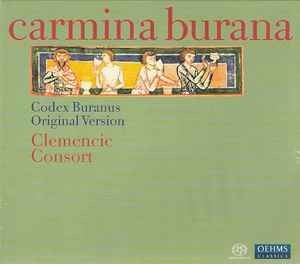 Not quite as good as the earlier 3xCD version (also available on vinyl) by the Clemencic Consort. Everything feels a bit more polished and 'tight' which unfortunately detracts from the spirit and 'energy' of the music. Still a brilliant interpretation of the CB, however. Only the New London Consort can rival the CC.